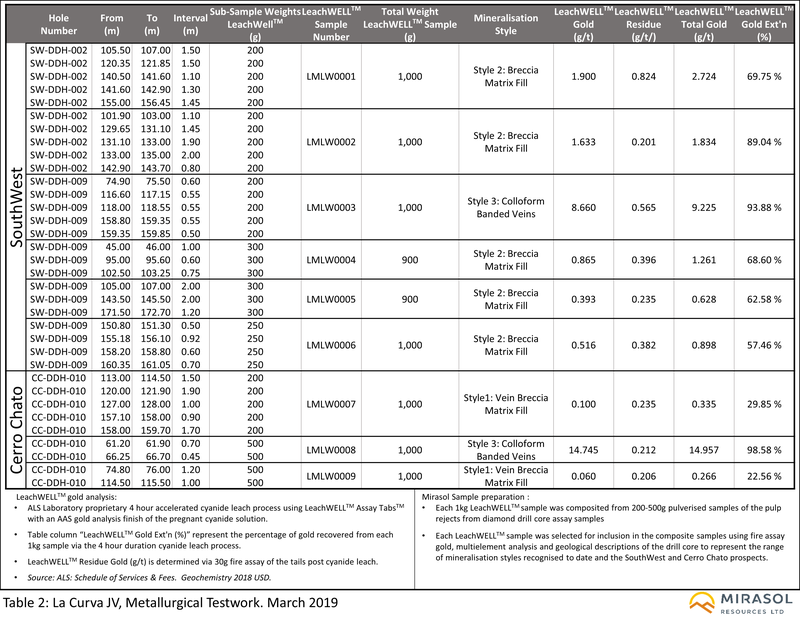 VANCOUVER, March 4, 2019 /CNW/ - Mirasol Resources Ltd. (TSX-V: MRZ, OTCPK: MRZLF, "Mirasol") is pleased to announce assay results from the second program of drilling and initial cyanide extractable gold tests of the mineralization from the La Curva OceanaGold (OGC) JV in Santa Cruz province, Argentina. The CEO of Mirasol, Norm Pitcher, stated "We are encouraged by the drill results received from this program and the initial indication of metallurgically favourable characteristics of the Au mineralization at the SouthWest prospect. Based on the results of this program high priority drill targets have been generated for future drilling". 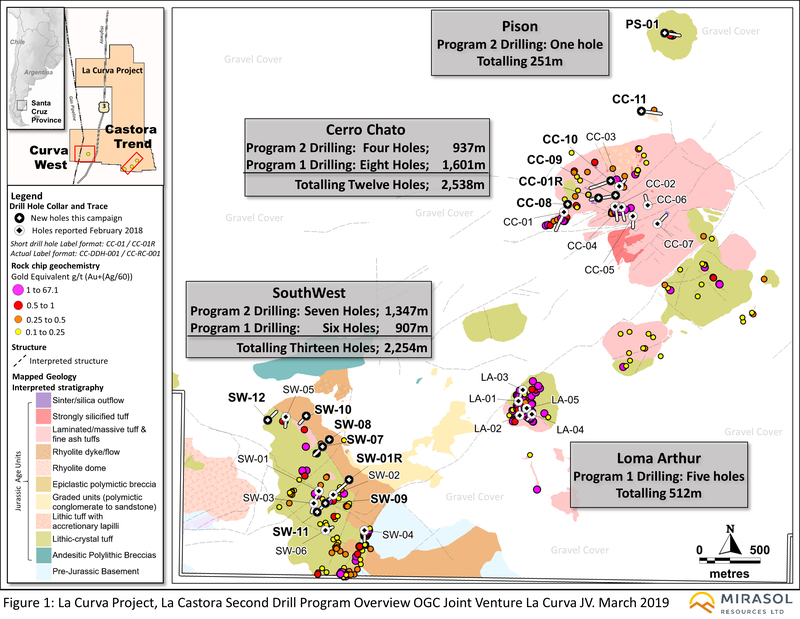 The second program of diamond core and reverse circulation drilling was completed at the project, totalled 3,227.8m in 17 holes, testing targets at the Curva West prospect and the Castora Trend&apos;s Cerro Chato, SouthWest and Pison prospects (Figure 1). Including, 0.45 m at 24.1 g/t Au and 87.3 g/t Ag. 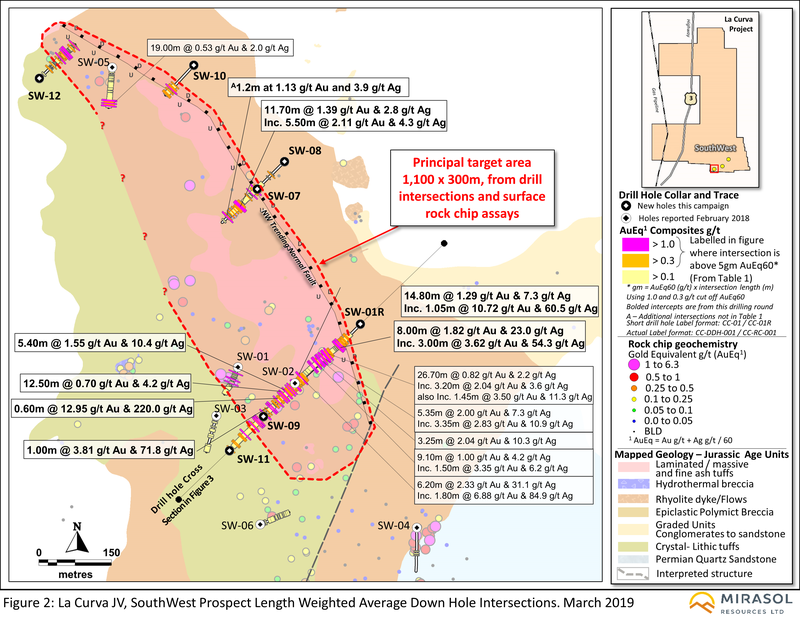 Results from all drilling to date and surface geology at SouthWest, outline a NW oriented 1,100 m long and up to 300 m wide target zone for Au+Ag mineralization. Cross sections through this target, show Au+Ag grades vectors to depth and the north, toward a large NW striking normal fault that may have acted as a "feeder structure" to mineralization. This structure represents a compelling drill target for higher grade Au+Ag mineralization (Figure 2 and Figure 3). Nine samples weighing up to 1 kg, composited from mineralized drill assay pulps from the SouthWest and Cerro Chato prospects, were assayed via the LeachWELLTM process, as an initial test of cyanide recoverable gold characteristics of the main styles of mineralization recognized to date (Table 2). Encouraging gold recoveries were received from the SouthWest prospect with 93.9 % gold recovery achieved from banded epithermal vein style mineralization and an average 69.5% from Mineralization Style 2, breccia matrix mineralization (with an average of 73.6% recovery from all samples for the prospect). The banded epithermal vein style mineralization at Cerro Chato returned a gold recovery of 98.58%, however recoveries for Style 1 sulfide veinlet and breccia matrix mineralization were much lower at the Cerro Chato prospect, averaging 26.2%. Petrographic analysis of the different styles of mineralization confirm free gold and ruby silver (proustite – pyrargyrite) are consistently present in the banded vein mineralization at Cerro Chato and SouthWest, and also present in the Style 2 breccia matrix mineralization at SouthWest, correlating with the samples showing better cyanide leachable gold recovery. Further exploration at La Curva will be directed toward drill targets where these metallurgically more favourable styles of mineralization are dominant. 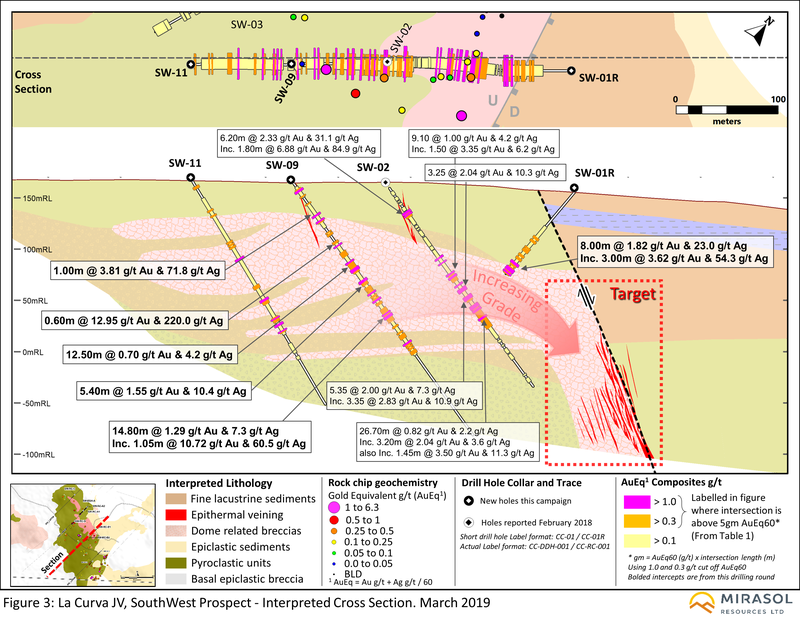 Integrated analysis of results and drill hole targeting are in progress ahead of an OGC and Mirasol JV meeting, planned for the end of March 2019, where future exploration priorities for the project will be decided. 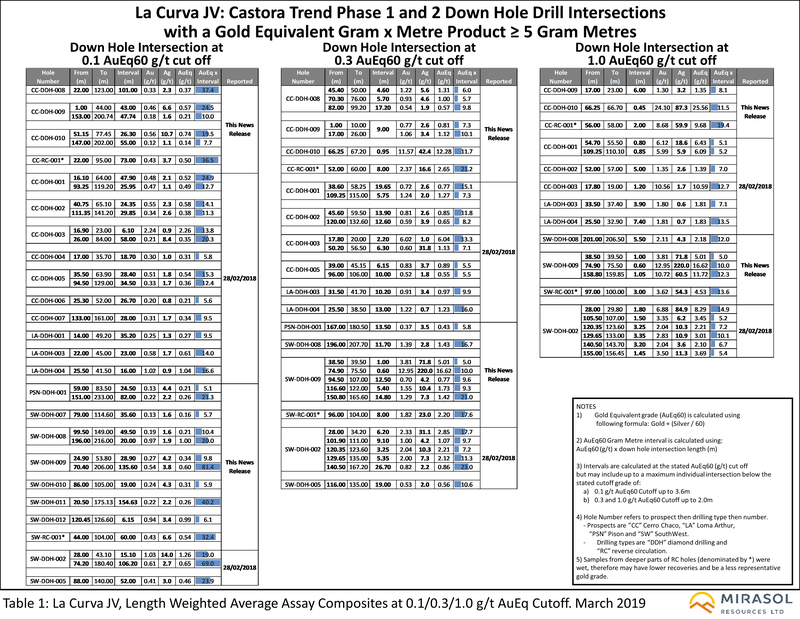 Additional Geological Information and Analysis of La Curva Drill Results are detailed on Appendix A in this news release. Stephen Nano, a Director of Mirasol Resources, has approved the technical content of this news release. Mr Nano is a Chartered Professional geologist and Fellow of the Australasian Institute of Mining and Metallurgy (CP and FAusIMM) and is a Qualified Person under NI 43 -101. All exploration on the project was supervised by Mirasol Stephen C. Nano, who is the Qualified Person under NI 43-101. Mirasol applies industry standard exploration sampling methodologies and techniques. All geochemical rock and drill samples are collected under the supervision of the company&apos;s geologists in accordance with industry practice. Geochemical assays are obtained and reported under a quality assurance and quality control (QA/QC) program. Samples are dispatched to an ISO 9001:2008 accredited laboratory in Argentina for analysis. Assay results from surface rock, channel, trench, and drill core or reverse circulation samples may be higher, lower or similar to results obtained from surface samples due to surficial oxidation and enrichment processes or due to natural geological grade variations in the primary mineralization.